This hatch is ABS Certified for use on ABS classed vessels or facilities by the American Bureau of shipping on ABS Certificate Number: 08-HS404092-3-PDA. These hatches are secured using the adjustable 4- dog quick-acting style of closure. Cover assembly is cast in high-strength aluminum for light weight. The deck ring is available either in galvanized mild steel (for welding into steel decks), or cast aluminum (for welding into aluminum decks or bolting to fiberglass or wood. Steel deck rings are hot dip galvanized for superior corrosion resistance. 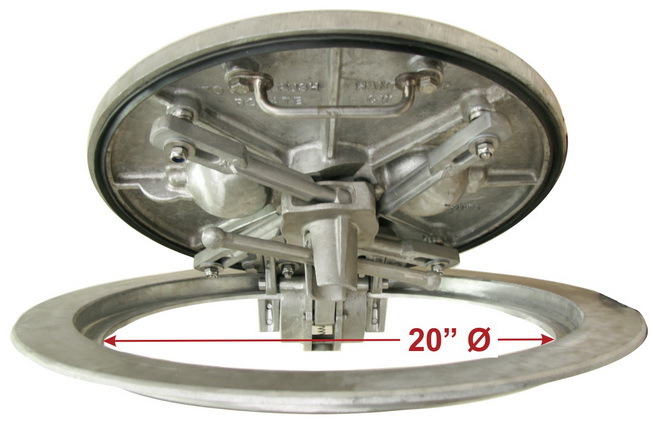 The Baier hidden Hinge series is available in clear opening dimensions of 20” Round, 15” X 24” Oval or 24” x 24” Square. Currently, the 4-dog BFHQ series hatch cover assemblies are available only in cast aluminum. However, the deck rings for the BFHQ are the same size as the Strongback models, and are available in galvanized mild steel or cast aluminum. Stainless Steel deck rings are available by special order. Optional spoked or un-spoked handwheels are available. Request the handwheel option from a Baier sales representative or Baier distributor at the time of purchase. Are you Looking for a coaming to go with this hatch? Please visit our Coamings Section for more information. Disclaimer of Liability: PDF Cutout drawings, Autocad® Cutout drawings and SSI drawings (the “Drawings”) are provided for convenience only without warranty of any kind. Baier makes no representation regarding the completeness, accuracy, reliability, timeliness or compatibility of the Drawings or that the Drawings will be error-free. Baier assumes no responsibility or liability for anyone's use of the Drawings, and Baier shall not be liable for any loss or damage of whatever nature (direct, indirect, consequential, or other) whether arising in contract, tort or otherwise, which may arise as a result of anyone’s use of the Drawings. We are working to complete our library of available drawings for our customers. If the drawing you want does not appear, is too large or otherwise unsuitable for your use, please contact us and we will investigate alternatives for you. This website is independent of Autodesk®, Inc., and is not authorized by, endorsed by, sponsored by, affiliated with, or otherwise approved by Autodesk®, Inc.
SSI files are digital models of Baier Equipment formatted for SSI™s popular ShipConstructor CAD/CAM software (XML files are compatible with ShipConstructor version 2016 R2 and greater). For a complete list of all available Baier Products formatted for SSI ShipConstructor go to our Download Library. For more information about SSI ShipConstructor Contact your local SSI Reseller to discuss the most cost-effective solution for you. Learn more.